Warning: Upper Wildcat Falls is extraordinarily dangerous; it has been the site of numerous deaths. 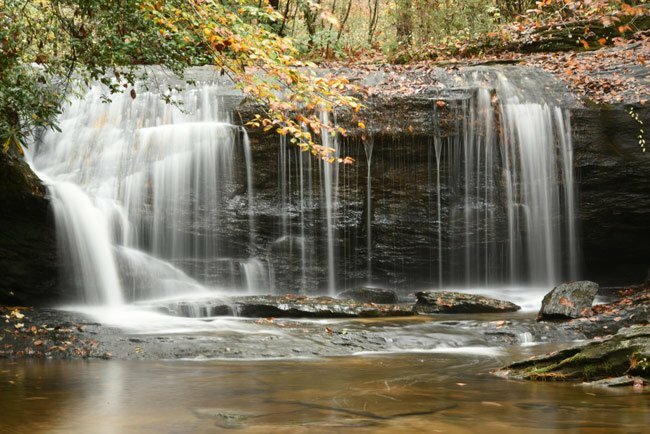 The lower section of Wildcat Falls, also called Wildcat Wayside Falls and Wildcat Branch Falls, can be seen right off the Cherokee Foothills Scenic Highway (SC 11) in Greenville County. No hiking is required to enjoy this portion of the waterfall, which means anyone can go! 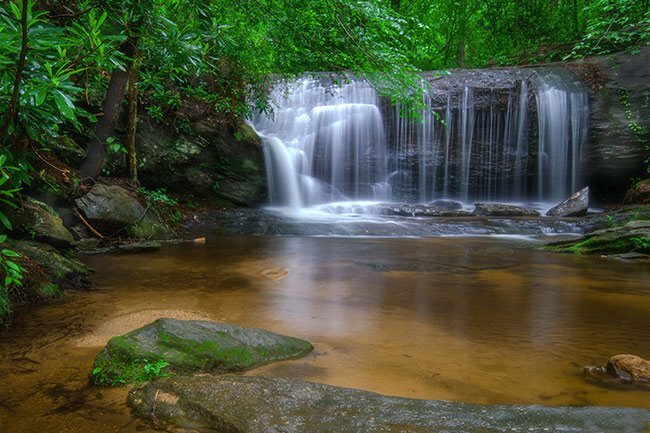 The falls, which are part of the Mountain Bridge Wilderness Area, are managed by South Carolina’s state park system. There are actually three tiers in all, each of which is fed by Wildcat Branch Creek, one of the tributaries of the South Saluda River. The waterfall visible from the road, shown above and below, tumbles 30 feet before landing in a shallow granite pool. The lower falls stand perpendicular to SC 11, and like most falls, they are best viewed after a hard rain. To the left of Lower Wildcat Falls lies a set of earthen and stone stairs. Climbing these, one reaches Middle Wildcat Falls, seen below, which features a 10-foot cascade. 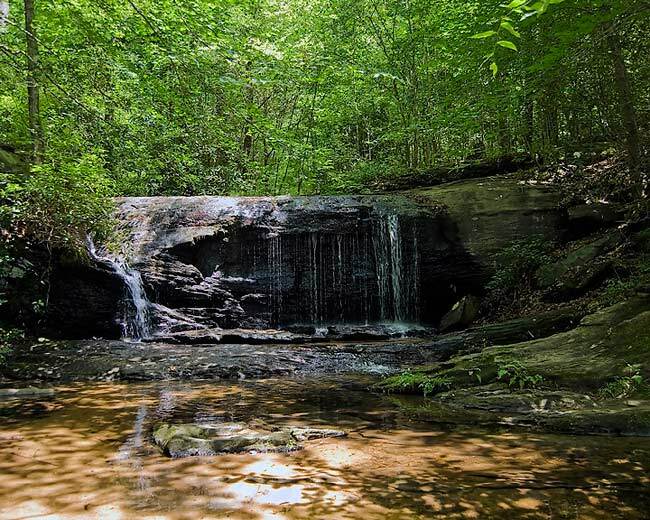 The trail crosses Wildcat Branch Creek at the base of the middle falls and leads to the foundations of a shelter built here in the late 1930s when the Civilian Conservation Corps, as part of Roosevelt’s New Deal, constructed what was then known as Greenville Wayside Park. This park was one of six set up in South Carolina to provide resting spots for traveling motorists. The shelter’s fireplace and chimney remain intact. Climbing a quarter of a mile further, one comes to the base of Upper Wildcat Falls, not shown. This tier descends in a 100-foot free-fall. Its crest is extraordinarily dangerous and has been the site of numerous fatal accidents. Rescue officials warn that no degree of caution can protect someone from tragedy at this slippery location. Although warning signs have been erected, they are commonly vandalized or stolen. 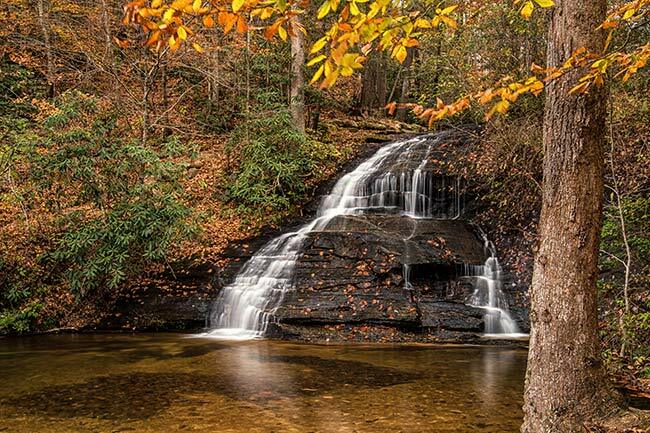 Please exercise extreme caution when visiting Upper Wildcat Falls and enjoy the view only from its base. The park system has closed the path after this point due to the danger of crossing the fall’s boulders. 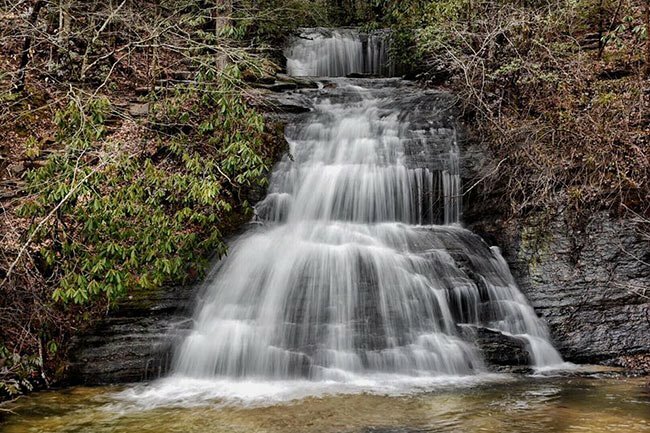 Wildcat Falls is located between two extremely popular state parks, Caesar’s Head and Jones Gap, each of which have many waterfalls and cascades within their boundaries as well. 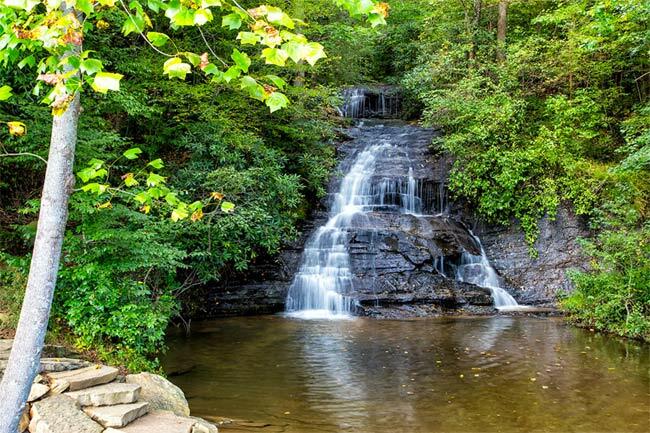 Another site not to be missed when visiting Wildcat Falls is the unmarked scenic overlook, known as Bald Rock Heritage Preserve and sometimes Shining Rock. Symmes Chapel (Pretty Place) and Saluda Hill Baptist Church are also nearby. Oh I’m sorry. Is nature getting in the way of your nature? Might as well cut a branch so humans can see it more clearly…….. These beautiful falls are partially obscured by long branches. Could the trees be cut back a little so the falls are more visible? Following the stairway to the left of the falls you will find a great trail leading to other interesting and beautiful sights including more waterfalls. We happened upon this spot to take a couple of pics of the falls and wound up making the easy hike through the forest. It was a nice trek enjoyed even by our 7 year old. I would recommend this trail to anyone just starting out or wanting to take your kids somewhere. It’s shaded and the trail is wide, making it easy to follow. Wildcat Falls, where on another beautiful autumn afternoon another hiker spent his last moments. Brent Elrod, a student at NGU, avid hiker, and wonderful faithful and caring young man died on October 10-10-2013. He will be missed by those who knew and loved him. My husband, Billy Joe Gorham, Sr., is the man who fell 100 feet from Wildcat Branch Falls last September 2, 2012. His fall caused his heart to go into cardiac arrest, but the blunt force trauma is what took his life. We were common-law married but intended to get remarried at the end of 2012. He really loved these falls and wanted to preserve them and also educate the public on the beauty and danger of nature. I hope and pray that everyone cherishes every moment they have with their loved ones, for you never know when that moment may be your last with that person. He was 59 years old, military trained, and he still slipped, fell, and died. Please help me preserve and take care of this wonderful place he loved so much. You can send a donation to the Jones Gap State Park c/o Rob Achenberg, Mountain Regional Chief, rachenberg@scprt.com, 158 East Ellison Lane, Pickens, South Carolina, 29671. Please help me make Bill’s wish come true and also to make it safe for everyone. I would not want to have anyone to go through what I or the family who by God’s hand was there that day had to go through. Help me put a permanent memorial marker at the falls for Billy Joe Gorham, Sr. and the other gentleman, Mr. Mark N. Jones. I have been going to these falls since I was a kid. Never knew the name. Glad to see a sign put up. Awesome place. I now take my kids there. Good hiking too. Easy.